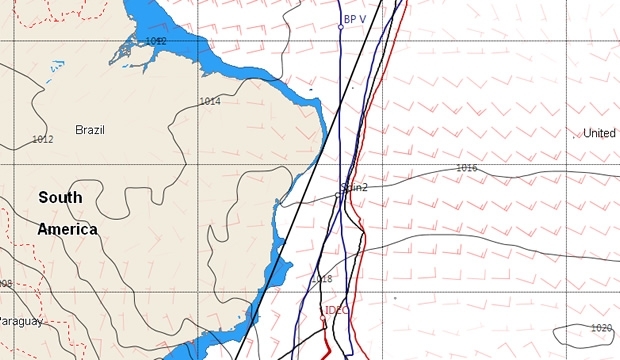 Both Spindrift 2 and IDEC are now into the South Atlantic trades but is it too little too late? Around this point in her Jules Verne Trophy attempt four years ago, Banque Populaire V was about to make easy meat of her Doldrums crossing. Unfortunately the same boat, now being raced as Spindrift 2 by Yann Guichard, Dona Bertarelli and their crew, are currently still making their way up the coast of Brazil. This morning they are passing the latitude of Salvador de Bahia roughly where Banque Populaire V would have been at around 0230 yesterday. Or, at 0900 UTC, a deficit of 791 miles on Banque Populaire V's pace (up from 611 miles yesterday). Thanks to the veering of the trade winds as Spindrift 2 has headed north, she has managed to stay some 200 miles offshore. Any easting she can get in at this stage will reap rewards once enabling her to sail a faster angle once she's back into the North Atlantic. We are awaiting the moment when Spindrift 2 can start recouping miles on Banque Populaire V, which should come soon. Now she is slightly cracked, her four hourly averages are up to 24-25 knots, whereas Banque Populaire V would have slowed slightly coming out of the Doldrums. Meanwhile IDEC Sport is finally exiting the clutches of the St Helena High having gybed north last night. Heading in the right direction, her boat speed is back up to 18-19 knots average, but she is now 1339 miles astern of the record pace which even the talented Joyon will struggle to recoup. The prognosis looking forward isn't great at present. Currently the Azores high is anchored in the middle of the North Atlantic, forming a 3500 mile long sausage of high pressure and light winds, the ultimate meteorological barrier for the boats. This is forecast to shrink east, but at present it still looks like Spindrift 2 will have to sail west as far as Banque Populaire did to get around its western edge. It will then be down to timing - can she key into a frontal system that might provide favourable westerlies to get them to the finish line on a more direct route than Banque Populaire V took? Or will a secondary area of high pressure develop over the Azores, forming a second barrier to her path as the GFS model has forming on around 4 January?